Are you an Angel for Autism? Autism affects an estimated 1 million Filipinos. 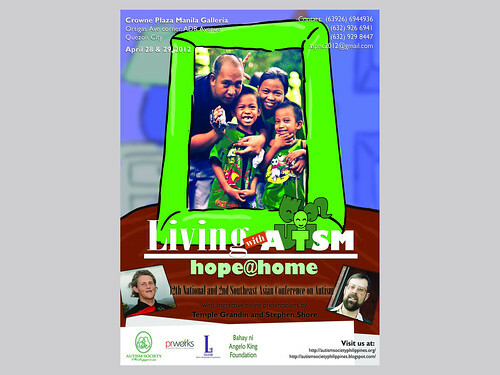 This year's national conference aim to promote, first and foremost, acceptance of autism within the family and seeks to empower families to make informed decisions to take bolder steps to ensure quality life of their children with autism. If you can't come to the conference, but would like to help, make your donation today. Kindly fax your deposit slip to (02) 926-6941 or email to aspnc2012@gmail.com. For more information, email us at or call us at (02) 926-6941 or (02) 929-8447. Donors will receive an email confirmation email and will be issued an Official Receipt. Every peso counts. Your generosity will go a long way in helping fund ASP's Programs and Services. Thank you for being an angel for autism.